Bathroom Decor - Hand painted metal bathroom wall hooks and toilet paper holders - Haitian metal art, Metal Wall Art, Recycled Steel Drum Art > Frog Toilet Paper Holder - Painted Metal Tropical Bathroom Design - 7" x 12"
Frog Toilet Paper Holder - Painted Metal Tropical Bathroom Design - 7" x 12"
Decorative toilet paper holder measures 12" high x 7" wide. 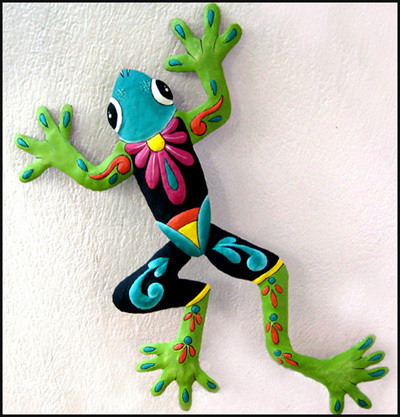 See this hand painted metal frog design in a 20" metal tropical art wall hanging. See matching frog wall hanging 2 sizes are available.